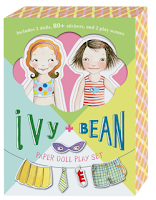 We love Ivy & Bean. Did you know that? I mentioned it here... and here... I have a Pinterest board, too. If you still haven't read any Ivy & Bean, well, they are two neighbor girls who thought they didn't like each other, but become best friends anyway. Bean hates to read. She's loud, tomboyish, and energetic. Ivy is a reader, a dreamer, and she tends to let her imagination run wild. 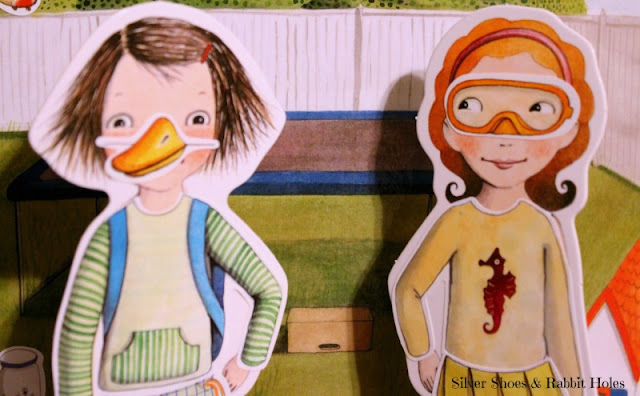 Put them together, and all kinds of shenanigans ensue! We read all nine books aloud together this summer and into the fall, and they had us in stitches. Now Big Sis is excited, because some of her friends are starting to read the series. And Little Sis has explained the characters to her four-year-old best friend, so that they can pretend to be Ivy & Bean on play dates. 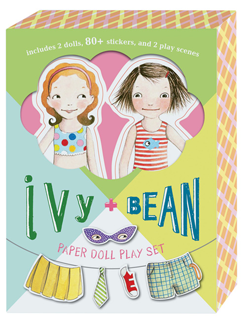 Big Sis received a lot of Ivy & Bean goodies for her birthday, including the Ivy & Bean Paper Doll Play Set. 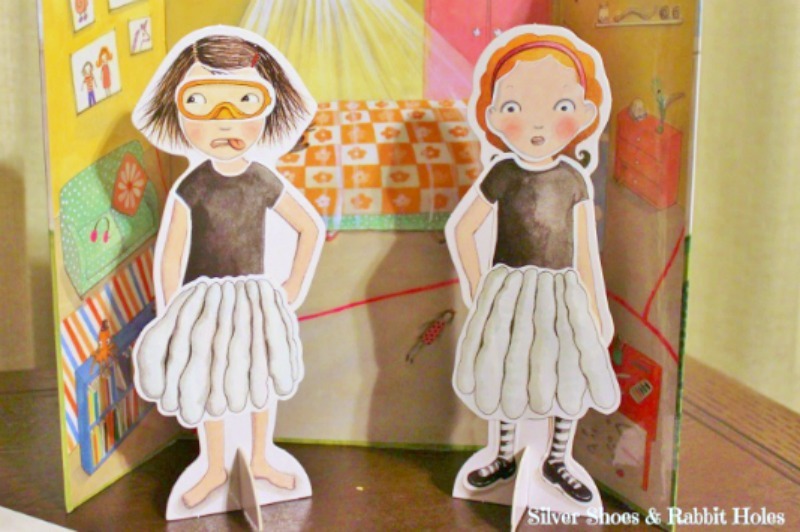 Now we have a second set of dolls, courtesy of Chronicle Books! I entered a contest on their blog to win a different book. Well, Stephanie at Chronicle was awesome enough to throw in two more gifts for the girls, and one of those gifts was the doll set! No fighting over what scene they want to enact! (Which may or may not be from the books - Little Sis likes to make up her own Ivy & Bean stories.) Now they each have a set of dolls to dress and pose. my face when I saw the photo quality. 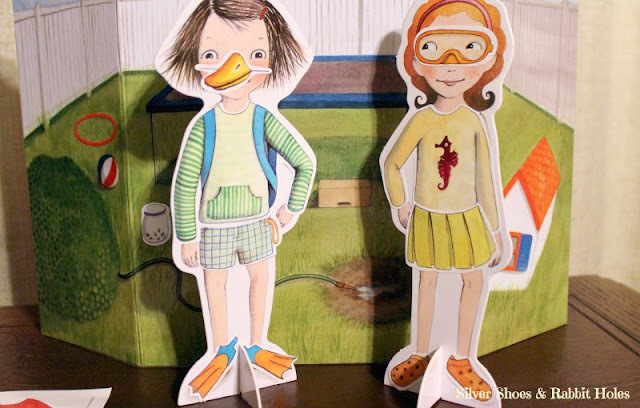 The dolls are not actually paper. Do you remember Colorforms? (If you don't, I have a Pinterest board!) 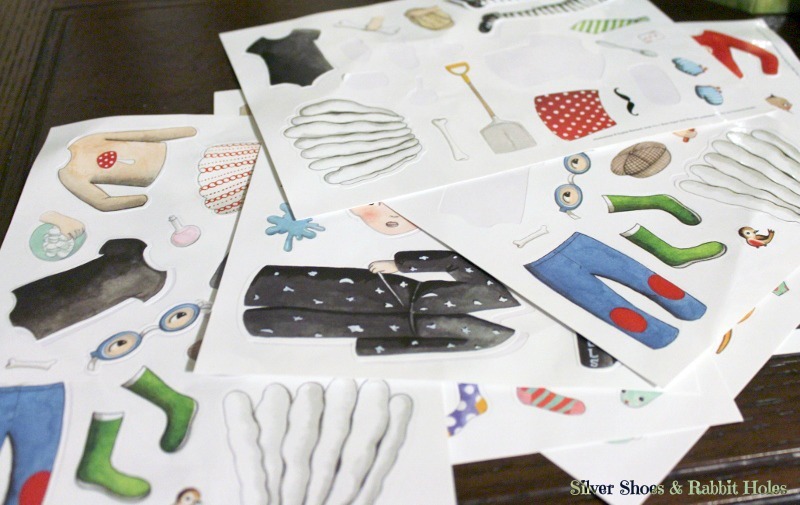 I was a Colorform freak as a child, and these are the same concept - vinyl clings. 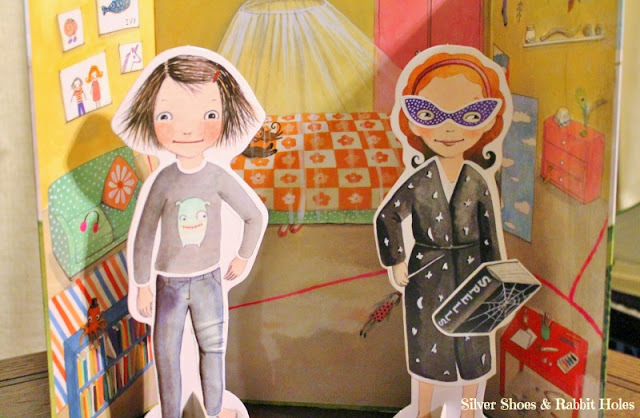 There are two dolls, with standees. 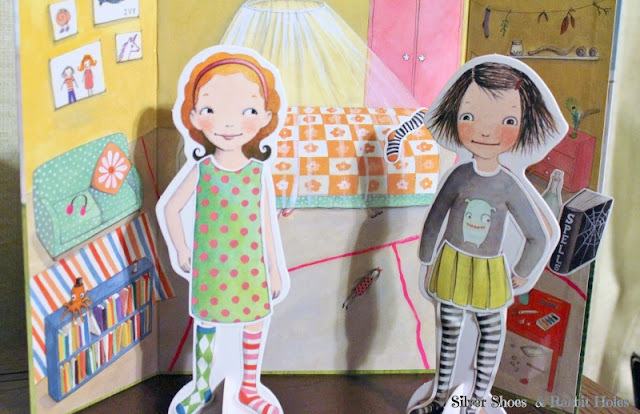 The folding background is Ivy's bedroom on one side and Bean's backyard on the other. Then there are sheets of clothes, costume pieces, props, and silliness! Ivy's room is my favorite. Look at the division lines on her floor! Just like in the books! Based on the books by Annie Barrows, illustrated by Sophie Blackall. You've been winning a few things lately - lucky girl! 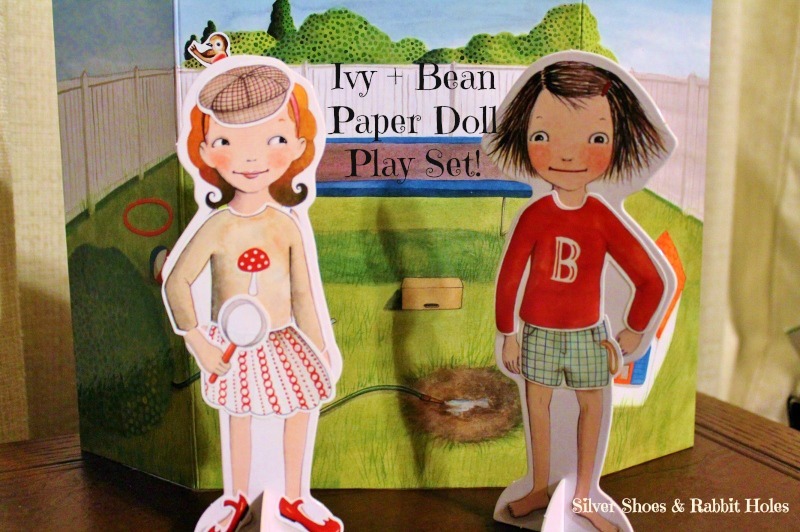 We just finished our first Ivy and Bean book and have started the next one in the box set. I think the books get funnier as the series goes on. I liked the first book, but the later books are the best! I have been lucky this year, as far as winning small things online. I wish it would translate into a lottery win! (Not that I play very often.) Or even an all-expense-paid vacation. Awesome win! Paper dolls are the very best! I agree! I'm happy Little Sis has her own set. At birthday time, I focused on Big Sis and her love of the series, not realizing how much it had captured the little one's imagination. I think it will be the first "big kid" series she grabs once she masters a little reading herself! Lucky me - I don't have to listen to them bicker over a set. ;o) And I totally had fun playing with them after they went to bed, of course. I had Barbie Colorforms! The dream house set, I think. I had so many sets of those, including Peanuts and Raggedy Ann, which were two of my childhood favorites. Colorforms and Paint With Water books could keep me entertained for days.